How does an Atelier come about when dance is its main core? 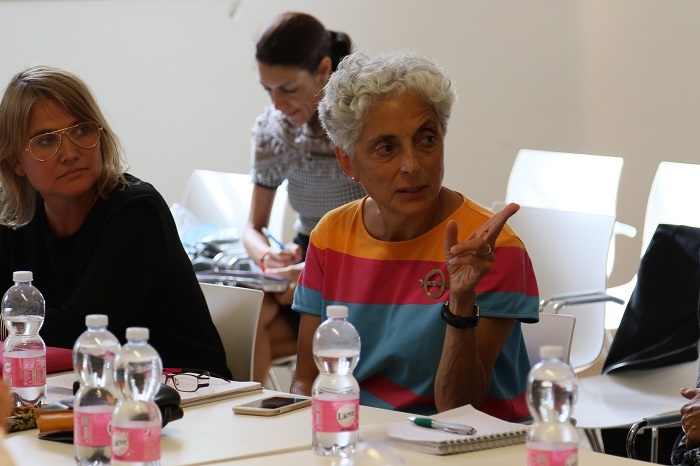 European Dancehouse Network has chosen Bassano del Grappa – city of Centro per la Scena Contemporanea – for its Atelier on Enhancing Citizens Engagement in Contemporary Dance. And dance is analyzed and lived at 360 degree, through physical practice, round table, working session, and evening performances. 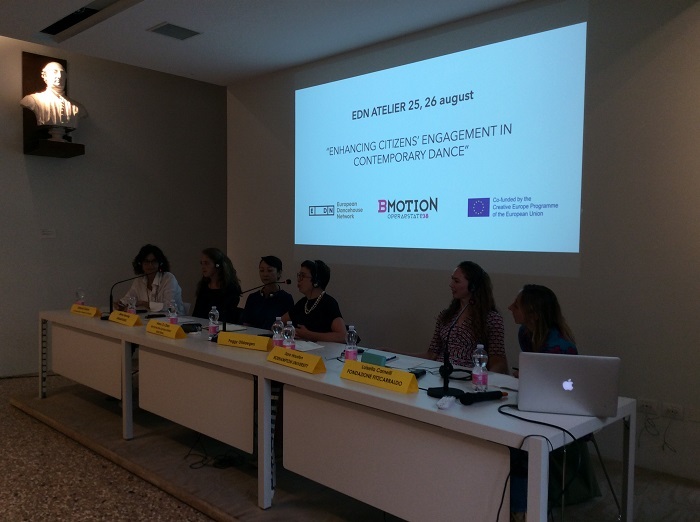 PART 2 of 3 – It’s not difficult to imagine how aware the public becomes, when participating then at the following first round table on Enhancing Citizens Engagement in Contemporary Dance. Led by the independent dramaturge Peggy Olislaegers, today we are listening to some professionals active in the engagement of citizens in dance in different contexts and territories. Among the panelists there are Luisa Carnelli, expert in audience development and audience engagement at Fondazione Fitzcarraldo, Stefania Cadore, shop owner involved in several editions of Dance Raids, where dance artists perform in various shop windows, Sara Houston, Principal Lecturer at Roehampton University and researcher on community dance, Merel Heering, dramaturge and festival programmer based in The Netherlands, and Anna Cy Chan, Dance Director at West Kowloon Cultural Distric, Hong Kong. Which is the difference between a Citizen and an Audience? Language not always help. The word Citizen seems more connected to local identity, while Audience is more related to a voluntary practice of participation. It comes out the word ‘participator’, to stress the active role of an audience who is not there only auditing, while the word ‘spectator’ may underline a more passive role. Rid of the political connotations, it’s clear that Art is a human right, «a collective responsibility where everyone has to take part in this process of legitimization» (L. Carnelli). How shall we behave then when facing an indifferent or uncomfortable audience? Communication through dialogue, better than through education, seems the common answer. But who’s in charge then of this communication? 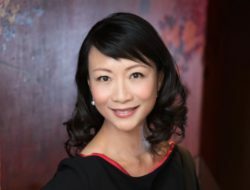 Anna Cy Chan, who has to build an audience for 5000 sits almost every day, has two perspectives: as a cultural institution there is the mission of bringing art to society with the awareness that, due to several boundaries, some audience will be excluded. But as an artist there is the duty to express the contemporary society, the responsibility to find and share ways to do so. Who’s in charge then of contextualizing a show? It’s the institution duty «not to expose the artist to unfamiliarity» (A. Cy Chan) and to connect people through «understanding of different dance aesthetics, agreeing to disagree» (S. Houston). So from one side the discussion has brought out the need to provide different kind of perspectives to enable and audience to understand a work through various points of view. On the other side, we must keep in mind that Art shouldn’t be taken for granted, as it is a sum of rights and duties. Questions follow one after the other. After “who”, how then can artists and audience be bridged? It’s suggested an alternative, additional, neutral space; to refunction a comfort zone with new ways of living it (L. Carnelli). The word space starts to be related to that of inclusion. New audiences have often several fears: where does the performance take place? how to get there? who will be there? how to behave? (M. Heering). It’s a challenge to make someone be conscious and aware that he/she is part of something. And let’s not forget the cyber space, an additional place for sharing and spreading contents, that everybody – artists, audience, institutions – can choose, design and frame (A. Cy Chan). A safe, respectful and constructive space comes out to be vital in the process of Citizens Engagement. An inclusive space where trust is built through the practice of listening and confronting (M. Heering). Again, communication though dialogue, where values are based on relationship and connection, and where you can stay connected even if you feel uncomfortable. 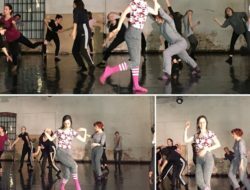 A practice of putting ourselves in someone else’s shoes (L. Carnelli), but also a challenge to play, as audience, an active role through our conscience, no matter we may or may not be dance experts (S. Cadore). The first round table ends with a question and a plea. Anna Cy Chan says: «We know the benefits that art has in a society, but are we aware of those who are not here? And about the artists, how do we reach those who haven’t been involved yet?». Stefania Cadore stresses instead the Italian situation: «In a historical moment where the official communication channels have no more titles, and Internet confuses the sources; where we are become ever more alone with an extreme need of expression, the artist has powerful means and a great responsibility to convey messages and provoke the citizen. 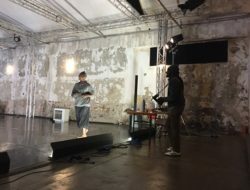 New ways should be found to be listened, by connecting the artists and the audience through respect, sharing and trust». 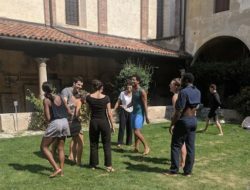 PART 3 of 3 – A quick lunch, and the EDN participants gather together accompanied by Betsy Gregory – performer, teacher, rehearsal director, programmer, producer, mentor and artistic director. 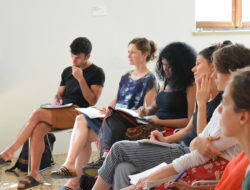 It’s time for the working session on the topic of the day, on how the content of the Atelier may inform the individual practice and initiatives of contemporary dance held at the various dancehouses. The discussion widens as more definitions, perspectives and strategies come out. London, Leeds, Zurich, Cyprus, Turin, Hamburg, Dublin, Marseille, Paris, Helsinki, Prague, Rotterdam, Aarhus, are some of the realities represented. The session starts again from the definition of the single audiences and their relation to citizens. The word citizen comes out to be related to birth, domicile, territory, rights and duty, but it is also perceived as a big circle which includes audience, which in turn includes spectators, represented by those who we are more connected with. Another concept comes out from the various definition, that of active vs. passive. 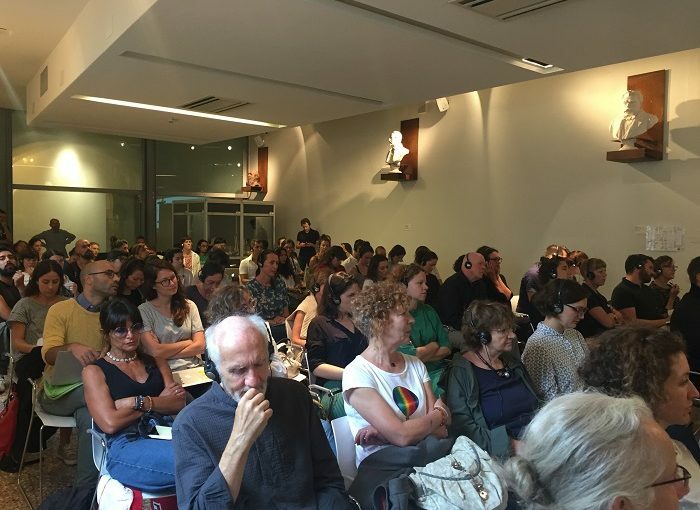 Audience seems at this point a more neutral definition, a passive response that doesn’t choose the cultural product offered, an exclusive club that pays and therefore has expectations. On the other hand the word citizen starts to bear an active role, as both the public and the artist live a citizen space. Citizenship becomes a crucial element to be aware and conscious of; Dance comes to be what helps people to feel part of a community, and Art claims its activism since you choose to be part of it. As in the morning, the conversation soon slides on a more human setting, wishing that those who come for a performance might be invited as friends to a party. Citizen and Audience are abandoned in favor of a more generic “people” that the dancehouses would like to reach empathetically. Friendship is the next key word. 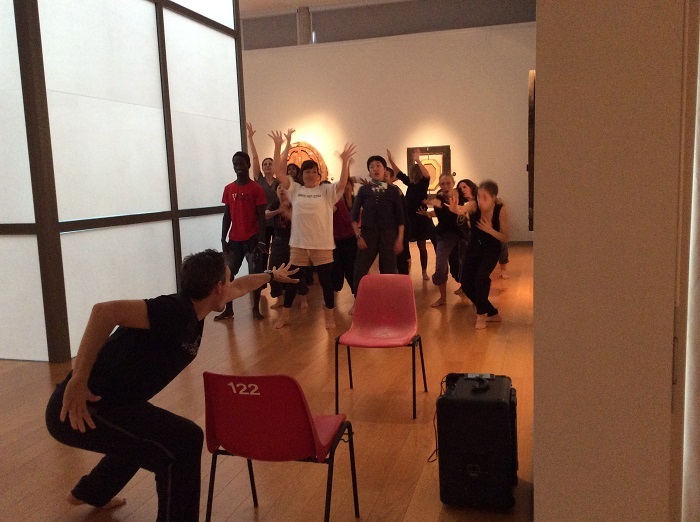 So how to empower people to realize how receptive they actually are in dance? Potentially everyone can become step by step audience, but then there is the risk that working on numbers you detach from these potential new friends. Everybody agrees on the importance of building relations which motivate people to come and see the work, but taking care that people who have come are then also willing to stay. Betsy Gregory mentions the expression cultural democracy, in an epoch where people are more in charge of their lives and want to say something more about it. Should the audience be addressed when making an artistic programming? Some participants had made some experiments, from questionnaires to open calls. It has come out – through interesting discussions, curiosity and new points of view – that it is crucial to know who these people are and what they are looking for. There is no doubt on the importance of communicating and building experiences, but if on one side there is the need of having a picture of the world, on the other side there is also the institution’s responsibility of giving means to people to experience the poetry of contemporary art. To develop the audience using the artistic tools empathetically. Some participants wonder skeptically how is it possible to include a wider reality when often those who practice dance are the first not to come to the Art centers. In addition, even when offering a multicultural programming, the audience is still not a mingled one. The solution seems friendship, again. To build trust, to take time with the different communities, to involve them in the welcoming process. The first working session ends with the question on how is it possible to shift the relation with a community. Meanwhile, waiting for new ideas and perspectives, the day couldn’t have been ended without attending together the evening of Bmotion dance festival!